Watching students squirm in their seats and contemplate the world outside our classroom always presented me with a challenge. The challenge was how to ensure that all my students exited with the skills to learn and acquire more knowledge than when they entered. One surefire way to gain their interest and enthusiasm was planning and executing a field trip. Somehow, leaving the confines of the school building and venturing into the great, and frequently unfamiliar beyond, ratcheted up the attention span and curiosity level of my charges. Amazingly, when off school grounds, even the most challenging student would undergo a mysterious personality change and become pleasant company. Even the bus ride away from school led to revelatory conversations in which random bits of information about family, food preferences, and spare time activities opened up a fresh perspective about the psyche of the kid who often seemed semi-comatose in class. Planning and funding the trip was not a task for the faint of heart. There were a myriad of forms, numerous required signatures, nagging requirements and provisos, and fund raising activities. Ah the suspense of not knowing whether the bus would be approved, permission slips would be returned with legal signatures, and if the requisite number of chaperones would arrive to allow this much wished for event to occur. Finally, would all this effort yield the hoped for results? The ideal scenario for a field trip for my students was a day to stay in motion, explore, get answers to burning questions, eat a good lunch, visit the gift shop and not get yelled at. As for me, I hoped for all of the above plus the rekindling of an enthusiasm for learning. Now that I am in the role of inviting and welcoming teachers and students to their field trip oasis, I am doubly excited that NMAJH has created a new membership program for teachers. This Teacher Membership is truly an impactful gift. It grants teachers unlimited free visits to the Museum, an inside track to Museum news and programs, discounts at the NMAJH store and café, reduced costs for school visits, and access to web content and teacher workshops. All these supports are available for the introductory tax deductible price of $36 a year. Teachers have always been high atop my list of heroes, and I hope that this sentiment is shared by many of you. So, do more than hug a teacher. Consider increasing their ability to reach all their students with a gift of a Teacher Membership to NMAJH. To purchase a Teacher Membership, please call 215.923.3811 x 106. Teacher Memberships will soon be available for purchase online! Would you stand for long hours in cold winter weather to be a voice for repressed people who live half a world away? An estimated 250,000 people did just that on December 6, 1987. The day before Soviet Premier Mikhail Gorbachev’s historic December 7, 1987 summit meeting with President Ronald Reagan, throngs of Americans from across the country gathered on the National Mall in Washington, D.C. to call for the Soviet leader to extend his Glasnost (or “openness”) policy to Soviet Jews and allow them freedom to worship and travel freely. Over two decades of advocacy preceded this march, which is believed to have been the largest-ever gathering of American Jews on the Mall. The event was organized by the National Council for Soviet Jewry, the Council of Jewish Federations, and the United Jewish Appeal, with the assistance of many local and national organizations. American Jews had worked very closely with the United States government in building support for Soviet Jews and the rally provided President Reagan with a timely talking point for his meeting with Gorbachev the next day. Although their talks were focused on disarmament, it is likely that the rally and the United States leader’s references to it and to human rights issues like the plight of Soviet Jews during the summit were effective. The remaining years of Gorbachev’s regime would usher in dramatically increased freedom to emigrate and hundreds of thousands of Jews would leave the Soviet Union for Israel and the United States. In honor of the 25th anniversary of this momentous rally, the Museum has installed a selection of Soviet Jewry advocacy posters from its artifact collection in its first floor space. 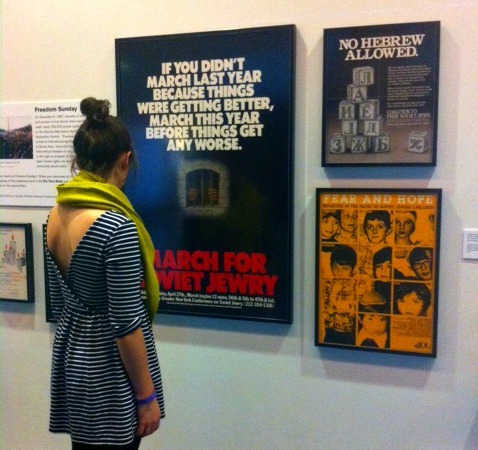 The posters were donated to the Museum by the Soviet Jewry Council of the Jewish Community Relations Council of Greater Philadelphia, the New York Coalition for Soviet Jewry, and the family of human rights activist Abraham J. Bayer (1932-1994), who led the National Jewish Community Relations Advisory Council's international concerns department in advocating for repressed minorities throughout the world for many years. This year, the National Museum of American Jewish History is honored to be a partner in Freedom 25, a “virtual march” commemorating the 25th anniversary of Freedom Sunday. Freedom 25 aims to empower more people to advocate for human rights throughout the world today. The Soviet Jewry poster installation is free and open to the public through December. One of the things that first struck me about the Museum when I began working here in Fall 2010, was the part of the exhibition on the 3rd floor focusing on the Jewish role in and contributions to the garment industry. It explains that Jews have had strong ties to the garment industry since the 1800s, and that that relationship continues with the many Jews in the fashion industry today. My grandfather once ran a factory in Brooklyn manufacturing clothes; this part of the exhi bition is one of the key areas truly telling my story. As a fashion-conscious person, I knew that many of the people whose names and brands we often hear about such as Levi Strauss, Donna Karen, and Calvin Klein are all Jewish. Yet I am still surprised to learn that many of my favorite designers, such as, Diane Von Furstenberg, Marc Jacobs and Zac Posen, to name a few, are also Jewish. Even many of the stores I’ve shopped in throughout my life like Banana Republic and The Gap were founded by Jews. That feeling that Jews are ubiquitous in the fashion industry became apparent when Michael Kors (who I had a sneaking suspicion was a member of the tribe) used the Yiddish word ungapatchka on an episode of Project Runway. Not your garden variety Yiddish, this was a word I had only heard from my mother and grandmother previously. Around the same time that I noticed all these fashion heavyweights were Jewish, I also noticed something unique in my line of work. In the arts, I think people dress differently than they do in many other professions. For instance, no one has ever asked me to take out my nose ring; I have actually received a few compliments on it. Our office is vibrant with color and self-expression in a way that complements who we are and what we have chosen to do for a living. After reading an article from The Wall Street Journal in which the author highlighted the way the staff dressed at a chic New York auction house, I thought we should highlight some of the well-dressed employees of the Museum. Of course, as a Jewish history museum, we put our own twist on the concept presented by the article: the clothes we are wearing in these pictures are made by talented Jewish designers or by their companies. So next time you head over to visit us on Independence Mall, see if we highlight someone who designed something you are wearing!